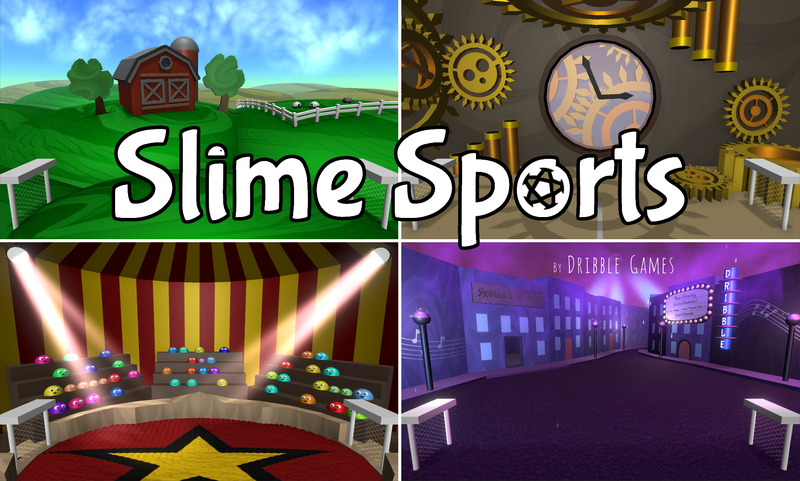 The newest expansion for Slime Sports is officially live! Apple Slime - Drop fruit on your foes to knock them out. Peaceful Pasture - Relax in the rolling green meadows by a rustic farm house. Clickity Clock - The gears are in motion. Can you use the pipes to your advantage? Cirque du Slime - High-flying action on a trampoline, what could go wrong? Jazzy Junction - Sip some coffee and watch the rain fall. Watch out, it's slippery when wet. Instead of a flat 3000 gems each, stages now start at 1000 gems and as you buy more the price of each stage increases slightly. More stuff available at launch! Explosion Slime (previously available only from winning tournaments or purchasing with gems) is now available for free. The newly created Sticky Slime is available as well. Additionally, 2 more stages are available. For those keeping track at home, that brings the free stage count up to 6 (and a total of 15 when they're all unlocked). New achievements to go along with the new slimes and stages.